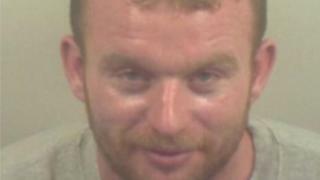 A man has been jailed for 10 years for repeatedly driving over a woman. Patrick Molloy intentionally knocked the woman down with his vehicle, before reversing over her body twice as she lay injured on the ground, police said. Molloy, 29, of Springhead Road in Northfleet, Kent, was found guilty of causing grievous bodily harm with intent at Woolwich Crown Court. He was also put on licence for a further two years after pleading not guilty to attempted murder. Less than 10 minutes after Molloy injured the woman in Dering Way, Gravesend, on 13 May last year, his car was found on fire in the same road. Molloy was also found guilty of criminal damage. The victim, who was known to him, suffered a head injury, but has since recovered. Det Con Nicolas Baxter said Molloy had shown "extreme and uncontrollable levels of violence". "The prolonged and repetitive nature of this assault shows he was intent on causing serious harm to the victim," he added. Molloy was also disqualified from driving for eight years.